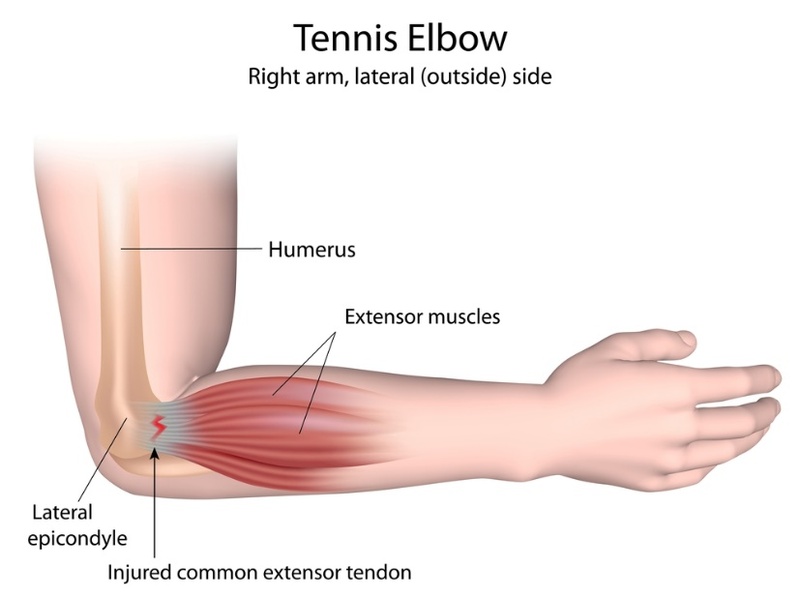 Elbow pain over the lateral aspect of the elbow is Tennis elbow, or lateral epicondylitis. 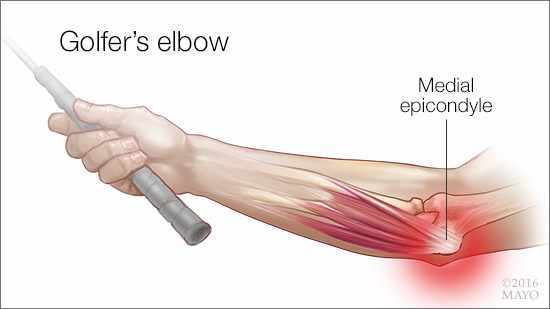 Elbow pain over the inside portion of the elbow is called golfer’s elbow or medial epicondylitis. Both conditions result from overuse—and is far more commonly associated with work activities, than with sports. However, active racquet players are far more likely than the general population to suffer from lateral epicondylitis at some point in their lifetime. Although both conditions are named for inflammation, the disease is actually a process of tendinosis—a process of chronic degeneration without significant inflammation. The elbow serves two distinct functions: 1) to bend and straighten 2) to turn the palm up and palm down. The elbow utilizes three bones in articulation to accomplish these purposes—humerus, ulna, and radius. 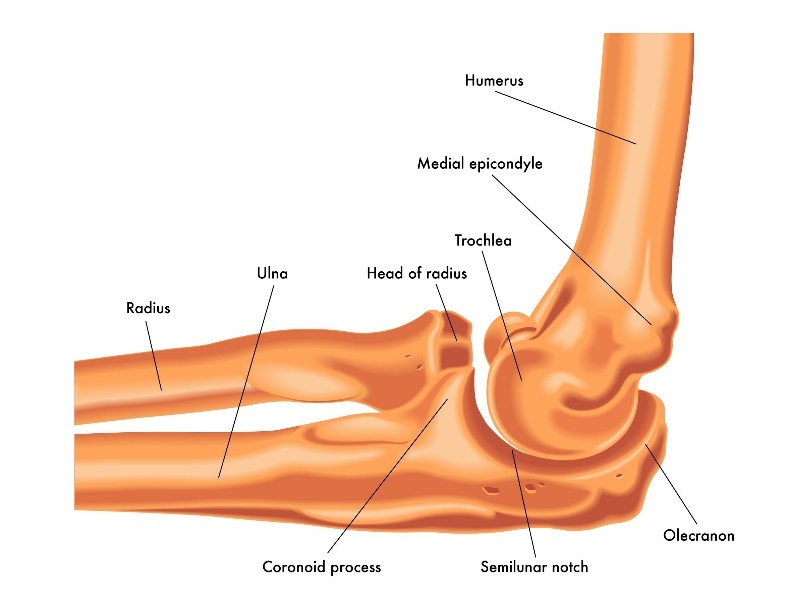 The bones of the elbow are held together by joint capsule, ligaments and tendons. As we age, the strength of both ligaments and bones decrease over time. After taking a history and noting your symptoms, a physical exam is then performed by the surgeon. The status of the vascular supply to the hand is observed. Similarly the sensation and motion of digits are noted. Point tenderness is localized and muscle strength is determined. Pain with either turning palm up or down is noted along with pain with either wrist flexion or extension. 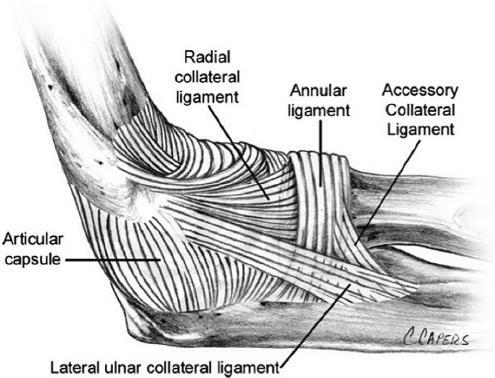 X-rays do not image tendon, but may be helpful to evaluate underling arthritis or fractures. Advanced imaging such as MRI is typically not needed, but may add additional information regarding ligament tears. A steroid injection of the tendon origin is often be indicated. These injections may be done in connection with mediations listed above. Exercise has proven a helpful adjuvant for elbow tendonitis. Exercise programs can be performed at home or under the direction of a physical therapist–Both methods appear equally effective in studies, with some studies showing better results with home therapy. Risks with injection include depigmentation, tendon rupture, and infection. Once improvement is achieved, players can begin a return to sport program. Proper equipment is vital—particularly for racquet sports where grip size and proper string tension is particularly important. Only 10-15 percent of patients with these maladies continue to have difficulty with nonoperative treatment and consider surgery. Typically surgery can be performed as an outpatient procedure under regional anesthesia. Most surgery performed for these issues are done as a small open incision with debridement and reattachment of the tendinopathy. Immobilization and physical therapy are the hallmarks of surgical recovery. Recovery when tendon is reattached takes months. The vast majority of patients improve with surgery, although not all are able to lift heavy items on a repetitive basis.